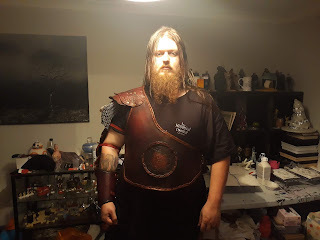 I don't just do historical source stuff - I love doing fantasy, LARP and alternative styles too! The majority of my work is based around a historical theme but from time to time I get to cut loose and play with designs, like the gladiator armour I was commissioned to make for a couple of performers from The Historical Combat Company! Going fantasy style on a historical them,e was SUPER-FUN and frustrating as hell in equal measure! I'm thinking about making another version of these as "off the shelf" piece for sale... what do you think would YOU buy it for your game system? ?